Assembly Round Up: The Northern Ireland Assembly is now dissolved. But what does that mean? Find out here. The Northern Ireland Assembly is now dissolved. But what does that mean? Find out here. Dissolution is the official term for the end of an Assembly. The Assembly was dissolved at 00:01 on Thursday 26 January, 2017. 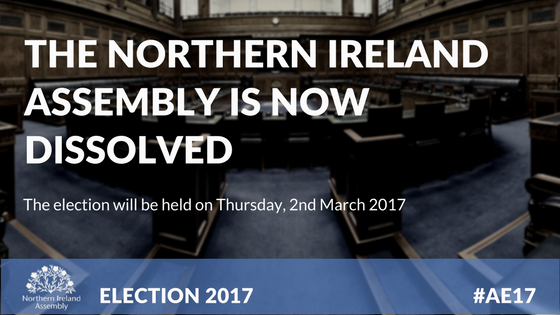 Elections to the next Assembly will take place on Thursday 2 March, 2017. Following the dissolution of the Northern Ireland Assembly, all MLA seats became vacant and no Plenary or Committee business takes place. The Stormont Fresh Start Agreement, signed in November 2015, stated that a bill would be introduced in the Northern Ireland Assembly to reduce the number of MLAs per constituency from six to five and have effect from the first "Assembly election after the May 2016 election. The Assembly Members (Reduction of Numbers) Bill was introduced on 12 January 2016 and became law (received Royal Assent) on 22 July 2016. The 2017 elections are the first elections since this Act became law. Therefore, five MLAs will be elected in each of the 18 constituencies and this will result in a reduction in the number of MLAs from 108 to 90. MLAs who were in post during the 2016/17 Mandate cease to be Members as soon as the Assembly is dissolved. They revert to being members of the public and lose privileges associated with being an MLA, to ensure that former MLAs do not have an advantage above other candidates. Those who wish to be MLAs again must stand again as candidates for election. As the Northern Ireland Assembly and the Government are two separate institutions, Government Ministers remain in office during dissolution, to manage and oversee the work of their Departments, until polling day (the day of the election). The Speaker (currently Robin Newton), along with Principal Deputy Speaker (currently Caitríona Ruane), and Deputy Speakers (currently Danny Kennedy and Patsy McGlone) remain in office until a new Speaker is elected at the first meeting of the new Assembly.